I attended my first Honours project seminar this week, the goal being to refine my project Aim's, Objectives and Research Question. So with some slight anxiety about sharing my thoughts with my peers for the first time I came in with some quick notes on my idea. 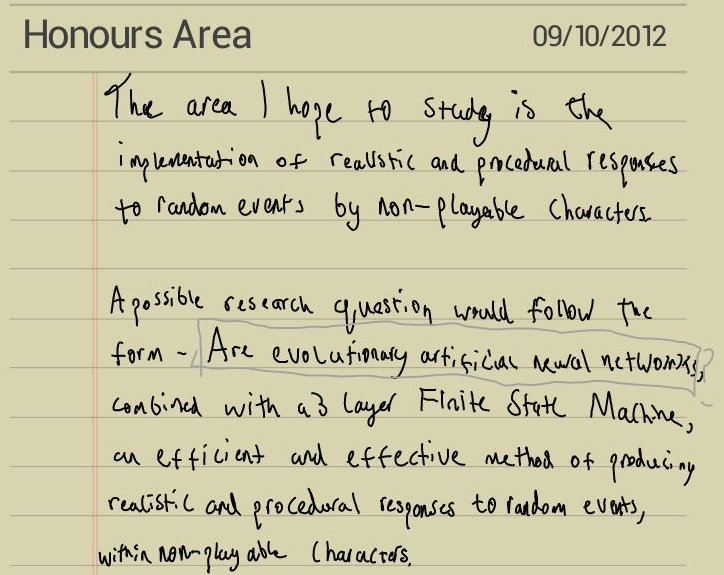 As shown below, the gist of it is a desire to research the area of NPC behaviour, in particular looking at how possible it is to make NPCs procedurally react to events in game. From the research I've done so far it looks using Neural Networks to classify the event and interpret the reaction (i.e. is the event positive or negative, or good for one faction, bad for another) then pass the outcome into the three tier Finite State Machine I've spoken about in earlier blog posts for actual actions. Being slightly unordered about my thoughts at this stage I did the last step first and had prepared a sort of research question for going in: "Are evolutionary artificial neural networks, combined with a 3 layer Finite State Machine, an efficient and effective method of producing realistic and procedural responses to random events within non-playable characters?" At this stage I'm certainly not set on evolutionary artificial neural networks and this may well be reined in when I start to look at the scope of the project. In the process of the seminar I developed this into an aim and set of objectives. 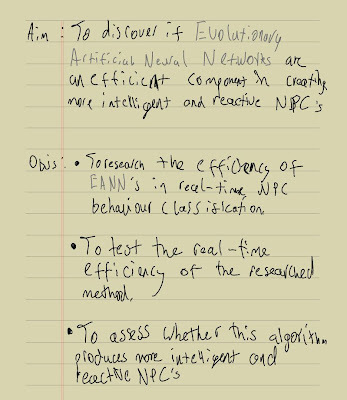 Aim: To discover if Evolutionary Artificial Neural Networks are an efficient component in creating more intelligent reactive NPCs. 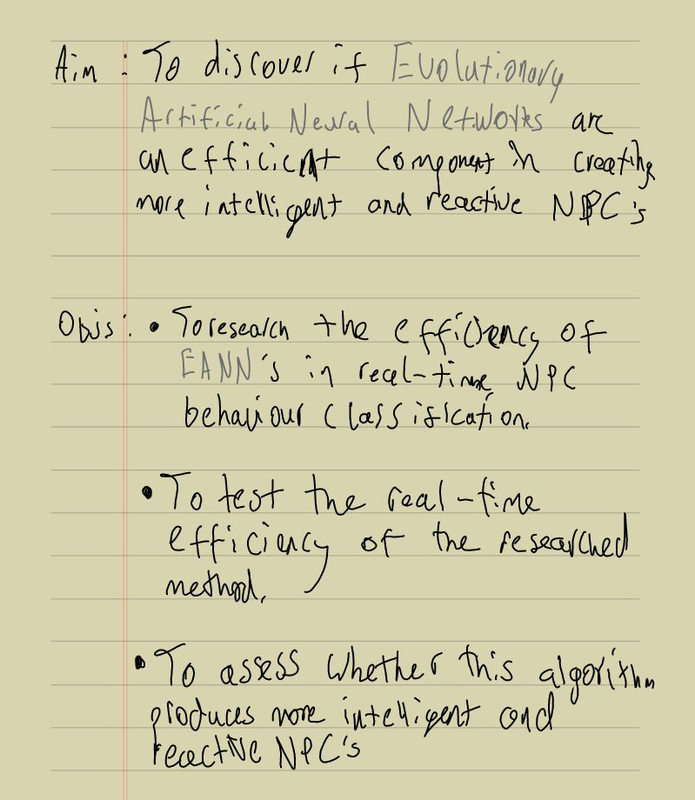 (Learning) To research the efficiency of EANNs in real-time NPC behaviour classification. (Doing) To test the real-time efficiency of the research method. (Analysis) To assess whether this algorithm produces more intelligent and reactive NPCs. 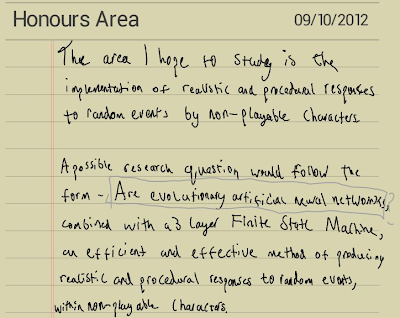 Finally, someone in my seminar group came up with a rather catchy name for the project: "Enhancement of real-time NPC Behaviour Algorithms."